There are many different ways in which the GT-Position system can be used! GamesOnTrack started out by developing GT-Position for the users of model trains. However, in the process of development we came to realise that GT-Position has the potential of working with all different types of moving objects. Now we are determined to integrate GT-Position in other moving objects, and create a world of possibilities within augmented reality. We want to break with the general division of reality and virtual reality, and create a scenario where both children and adults can play their favourite games in the actual and virtual reality at the same time. In that connection we have made proposals for some of the major toy manufacturers that specialises in moving and remote controlled toys. Our proposal is based on the idea to get users of moving and remote controlled toys to be in both the actual and the virtual world at the same time. We know this is possible with GT-Position, and we are working closely together with the IT University of Copenhagen, to make a demo of both a single-player and multi-player game set-up. With GT-Position all of the movements from a moving object is measured and recorded, and therefore it will be possible for users to create and outline their own private track course on to a computer. Afterwards the users will be able to follow the object around on the screen and in the actual room. 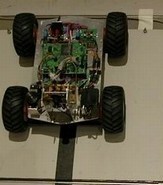 It can then become a competitive factor to try and move around in the exact track as outlined on the computer. Further, it is possible with GT-Position to create different parameters making the game more challenging. For example you can make virtual obstacles, such as bombs on the track, which you will have to overcome when going around the track. At the same time you can make obstacles on the actual court that also needs to be overcome, and thereby create both actual and virtual challenges. A point-system can then be made, giving points according to for example how fast you complete the track and how many obstacles you avoid. In this way you can create your own games using GT-Position, and at the same time you get the experience of playing in both the actual and virtual reality simultaneously.